HomeBreedsBorder Collie German Shepherd Mix – The World’s Best Family Dog? 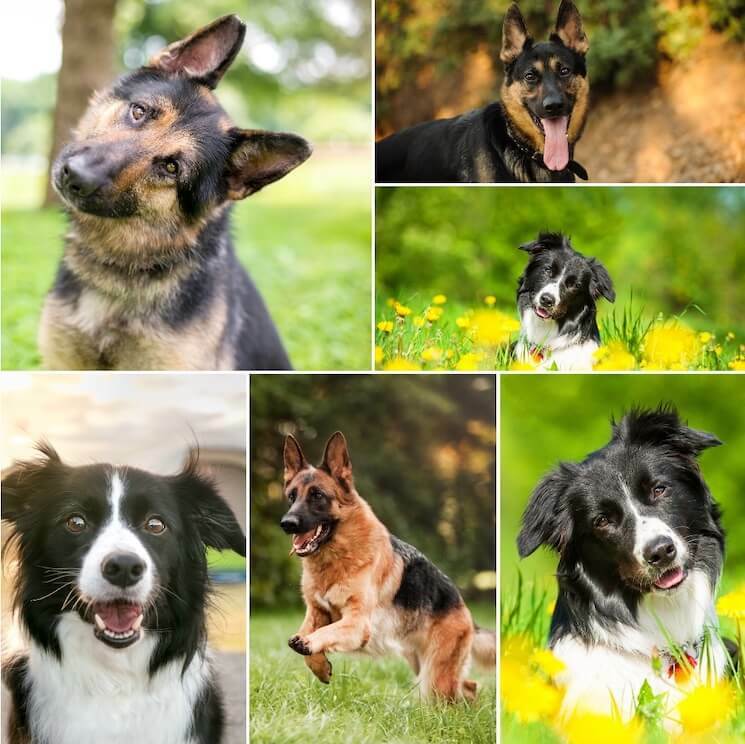 The Border Collie German Shepherd Mix is a highly energetic and intelligent designer dog breed created from two of the best herding dog breeds in the world. They are extremely loyal and would be ideal working dogs be it in herding, guarding or police work. They also make a lovely companion for someone who can give them the amount of mental and physical stimulation they need. Lovingly named Shollies, these dogs are a lot of work but totally worth it. In this article, we’ll talk about appearance, temperament, care, and much more. What is a Border Collie German Shepherd Mix? What Does This Mean For The Border Collie German Shepherd Mix? Is a Border Collie Shepherd Mix a Good Family Dog? How Long Do Border Collie German Shepherd Mixes Live? How Much Does A Border Collie Shepherd Cost? The Border Collie German Shepherd mix is a cross between two of the world’s best herding dog breeds. To create this hybrid, the parents must be one purebred Border Collie and one purebred German Shepherd. Both of these breeds are certified by the American Kennel Club so breeders should be able to provide paperwork for both parents. The Border Collie German Shepherd dog is a cross breed so is not certified by the AKC. However, they are certified by the Dog Registry of America and the American Canine Hybrid Club. 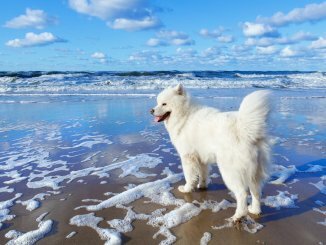 This energetic, intelligent, loving breed is becoming very popular with people who want a solid working dog or a loyal companion. The Border Collie German Shepherd mix is a large sized dog weighing up to 80 pounds in weight. As they are a cross breed, the characteristics they inherit from each parent will be different in each puppy. The overall appearance of this breed tends to lean more towards the German Shepherd parent. With their muscular large bodies, they are often mistaken for purebred German Shepherds. Their floppy ears and Collie tail will give them away as crossbreeds. Although a Shepherd is their most common appearance, each puppy will inevitably be different in appearance. No matter how they look, these dogs will have strong muscles and high levels of stamina, great for herding cattle. This breed tends to lean towards the German Shepherd parent so they’re likely to be a large sized dog. Fully grown, they should be around 21 to 27 inches tall and weigh around 70 to 80 lbs. If they lean more towards the Collie parent, they may be shorter and weigh less as Collies generally only weigh around 40 lbs. Their coat will probably be a solid tan color with black patching and points. If they inherit their Collie parent’s coat, the pup could be any mixture of over ten different colors including white, black, blue merle, red and sable. They will have a straight, dense, medium length coat, as both parents do. If they take after their German Shepherd parent, it will be a double coat. This means that it will be noticeably thicker especially in the winter months. If they are a working dog, this double coat will be great for working in cold weather. Being a hybrid, the Border Collie German Shepherd will display a temperament and personality which is a mix of their purebred parents. The best way to make an educated guess about their temperament is to look at their parent breeds. The German Shepherd was originally bred as a herding dog. Highly energetic and extremely intelligent, these dogs are very eager to learn. This is the reason they’ve been picked up in the K-9 corps as a police dog. 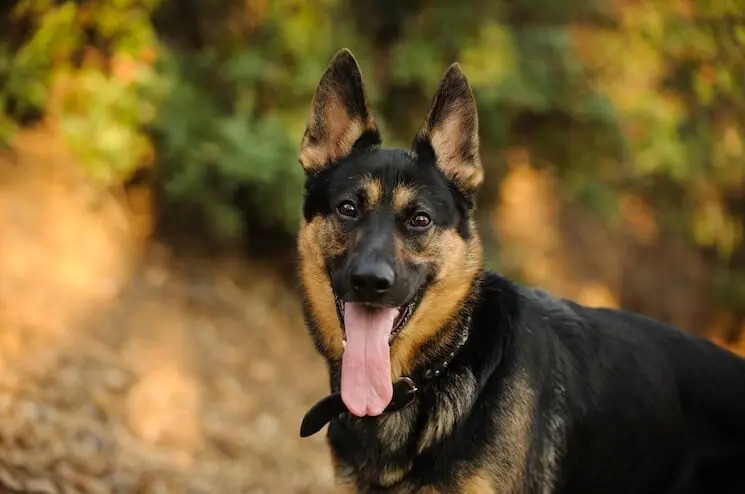 Despite this, German Shepherds are not naturally aggressive and are actually very loving dogs that are loyal to their families. It is true that this loyalty can lead to them being protective and so they will often bark at anything strange in their territory. A Collie was also bred as a herding dog and is one of the most common dogs used by farmers in the United Kingdom to manage their flocks and herds. Like GSDs, Collies are also energetic and very intelligent; ranked number one across all dog breeds. The downside is that they always need something to do otherwise they get bored very quickly. They are more playful than the German Shepherd but may have more issues with separation anxiety. With both these breeds in mind, we can definitely say that this hybrid is well above average in energy and intelligence. They make fantastic working dogs as this provides them with a job to do and plenty to keep their mind active. They will want to be with someone most of the time. Leaving an energetic and intelligent dog alone is a recipe for destructive behaviour such as chewing on furniture and barking. If you do just want this dog as a companion animal, be prepared for lots of exercise, playtime and training sessions. These dogs can be protective so plenty of socialization from an early age will help. Lots of different people coming in and out of their space is very important. This will reduce the likelihood of them becoming defensive to new people. If they are the only dog in the house, be sure to socialize them with lots of other dogs to prevent guarding behavior over you and your family. If you are thinking of purchasing this breed as a guard dog, we would recommend a specialist training course so you don’t accidentally train them to be people aggressive. Both parent breeds are comfortable around other animals, especially livestock or cats. They can live happily with other dogs and having a doggy friend may help keep them entertained. This mix is a great family dog as long as it was socialized with its family from a young age and not left alone with young children. All family members should be consistent with training to prevent the dog from receiving mixed messages and diluting the effect of training. As with all dogs, it would be unwise to leave young children alone with them. The best form of training for any dog is positive reinforcement and repetition. This is especially true for this hybrid as they do not respond well to negative reinforcement and it isn’t an effective training technique. 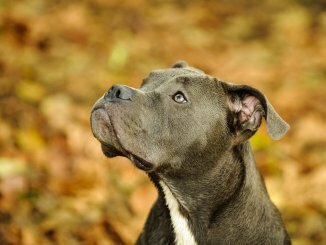 This breed is usually a food-focused dog which makes it easy to train with treats. Some mixes may also respond to toy-focused training which would be great if your dog is going to be a working dog or even train in agility or obedience. They will require a lot of socialization with people to reduce any guarding behaviors and aloofness. Naturally, this breed is not an aggressive breed but it is always good to socialize a puppy with other puppies to teach them canine manners. The Border Collie Shepherd Mix should be easy and enjoyable to train because they are so intelligent. If they are a working dog, this shouldn’t be a problem as they will have a job to do and plenty of training to keep them occupied. If they are a companion animal, you should definitely look into interactive feeders, plenty of toys for chewing and other games. For games which will stimulate your mix, fetch will be an important one. This will burn off lots of energy and won’t be as strenuous as an hour walk for you. This herding mix requires plenty of care and attention. They need exercising for at least two hours a day, time in the garden, playtime and other forms of mental stimulation. If they are a working dog they may get most of this on the job but as a companion animal, they will need this provided in other forms. Grooming should be completed a minimum of two times a week; especially if they have a double coat from their Shepherd parent. Someone best suited to owning this breed is either at home most of the day or works with this dog. You will need to be fit and active to keep up with a Border Collie German Shepherd Mix! These mixed breed dogs are a very high energy hybrid. This means a fenced in backyard is a must so they can go out when they please and work off some energy. These dogs are not suited to living in apartments or houses without gardens. 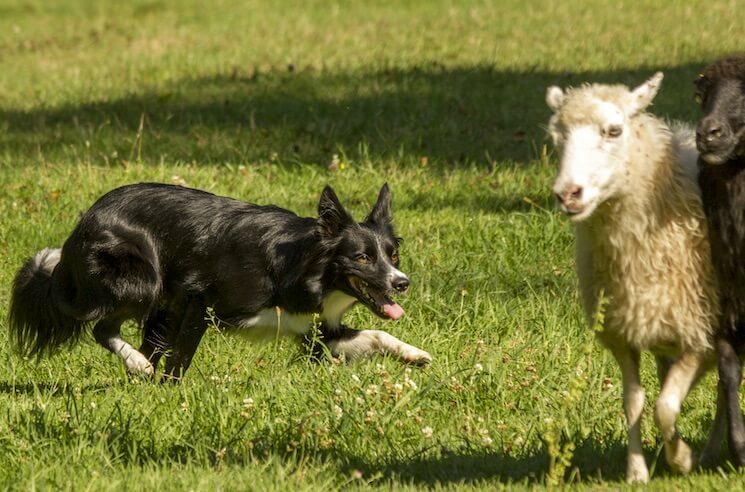 If they are working as a herding dog, they will be able to run off a lot of that energy doing their job. If they are a guard dog or companion animal, they will need to be out of the house exercising for at least two hours a day. You should walk your dog a minimum of twice a day for at least one hour each time. These dogs are great off leash as they are highly intelligent and should master recall pretty quickly. It means they can run off steam while running circles around you. Even if they are a herding dog, it’s always good to take them on walks when they’re not working as it allows them to relax rather than being constantly vigilant. Agility classes are also an excellent way of burning off steam and excellent as a form of mental stimulation, especially for this breed as they have a great body type for agility work. If your dog does have a double coat, you can expect seasonal shedding. This is where they shed loads of fur twice a year in the Spring and Fall to make room for the new coat growth. Even if the coat is not double, these dogs will still shed quite a bit throughout the year and so will need brushing a minimum of twice a week. With lots of treats and positive reinforcement, grooming should be a good bonding time for you and your pup. You should take your dog to be professionally groomed a few times a year, especially around shedding season if they have that double coat. This will help prevent matting and keep their coat super healthy. The Border Collie German Shepherd Mix, when fully grown, should be fed one and a half cups of good quality dry food twice a day. This can also have wet food mixed in with it. Good quality dry food will have a very high percentage of protein. This is because dogs require at least 25% of their diet to be protein. Things to avoid in dry dog food are any type of food dye, rendered fats, and corn or wheat gluten. People with working dogs often swear by a raw food diet. This is where the diet is made up of unprocessed meats, bones, fruit and vegetables, some dairy and eggs. All dogs are prone to certain health conditions and age-related issues. Being hybrids, the Border Collie German Shepherd Mix is less likely to develop genetic conditions that its pure bred parents are, but, there are still some issues you should look out for. Hip dysplasia is the big one as this is very common in both German Shepherds and Border Collies. Issues with eyes and ears are also common so make sure you see a full health check of your pup’s parents before you part with your money. Regular cleaning of the ears should reduce the chances of ear infections. These dogs are expected to live for between 13 to 15 years although some have lived up to 17 years of age. 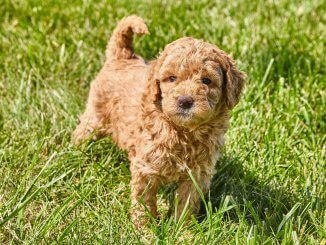 When buying any puppy, the most important thing you can do is look for a reputable breeder. This will improve your chances of buying a puppy with good health. At the same time, you’re also doing your bit to prevent bad breeding and puppy mills. You should be able to interact with both the puppy’s parents or at least the dam (i.e. mother). As both parents should be purebred dogs, you can ask for AKC certification. Ask to see health checks of the parents as well, including eye checks and hip scores. Check the puppies are up to date with vaccinations, worming and flea treatment. A breeder should not be desperate to sell you puppies because they should want to make sure they are going to the right homes. They should ask you lots of questions and may require pictures of your home environment. Be sure to ask lots of questions back. If you do want a working dog, go to a breeder that uses working dog parents. This will mean they are breeding for the type of temperament needed for working dogs and not for companion animals. Border Collie German Shepherd Mix Puppies will cost around $450 to $950 USD. This is less than the cost of either of their purebred parents. Be sure not to be drawn to prices much lower than these for puppies as you may end up supporting bad breeding practices or puppy mills. The Border Collie German Shepherd Mix is best suited for someone who is fit and active so they are able to provide the high levels of exercise and stimulation that this dog needs. It would be good either to have an owner who is home most of the day or who works the dog. A fenced in backyard is a must for this breed. They would make an excellent working dog. They are playful, loving and loyal dogs who will always want to be with you. They will need lots of time dedicated to walks, playtime, fetch and other forms of exercise. Keeping them stimulated mentally will be a lot of work, but a lot of fun too. Agility classes and training them to do tricks will be a wonderful way of bonding with your pup.